Quality Concrete is New Jersey’s trusted concrete supply company in Monmouth County. Since 1987 we have been delivering concrete for pouring to thousands of customers every year in Monmouth County and know exactly what is needed on the job site. With our fleet of mobile concrete mixer trucks we deliver concrete directly to your location, charge you only for what you use and ensure the quality of the concrete. We are the convenient, high quality solution. We use mobile mix trucks in Monmouth county because they offer advantages that barrel cement trucks do not. We want your project to succeed and our trucks are part of that solution. Traditional drum or barrel concrete mixer trucks are preloaded at the plant with a specific amount of pre-mixed concrete. You have to estimate the amount of concrete you will need. If you underestimate the amount of concrete you need then you have lost a day on a project waiting for the next truckload. If you overestimate the amount of concrete you are paying for concrete that you will not use. If you do not use the concrete within 45 minutes of it being mixed it begins to degrade. You assume too much risk when purchasing a truckload of premixed concrete. Each mobile mixing truck carries all of the different ingredients in separate compartments. When concrete is needed the ingredients are mixed while being continuously metered and proportioned to exactly the right mixture. If you don't need more concrete you are not charged for the unused raw materials in the truck. Fresh concrete is created in the precise moment that you need it eliminating travel time. The concrete mix can be adjusted immediately for weather or use type. You avoid any of the risks associated with barrel cement trucks. Here at Quality Concrete our employees serving monmouth county are certified by Zimmerman Industries in concrete science and testing, maintenance and operation of the volumetric mobile mixers, concrete aggregates and finishing, varied weather production and specialty concretes. With 20 years of experience and thousands of satisfied customers Quality Concrete is the best choice for any work done in Monmouth County. Give us a call if you have any questions or would like a free estimate 1-855-246-4278. With the help of Quality 1st Concrete a brand new basketball court was made. We delivery freshly mixed concrete right on site so you only pay for what you use to complete your project! The concrete for this driveway was mixed right at the job site and poured straight out of the truck. A local Mason, All About Ashpalt, learned the benefits of using a Zimmerman Mobile Mixer when he ordered 4 yards of concrete last week. He was doing sidewalk replacement and instead of the normal 4 inch thick slabs they were 5 inches. Instead of having to get a second truck out and being wacked with a second delivery charge we were able to mix the extra concrete on the spot and have the mason time and money. Want Concrete without the Delivery Charge? We have recently finished setting up our contractor concrete pickup location. If you need concrete but don’t want to pay for the delivery charge just give us a call and then stop on by and pick up your concrete. This concrete is made fresh so you will have plenty of time to take the concrete back to the work site and finish the job. In the pictures below we filled up a pickup truck with 2 yards of concrete and the contractor was able to get back and finish the job. Concrete comes in many different strengths known as PSI, the average PSI used ranges from 3000-4500 PSI with 3500 PSI being the most common. The higher the PSI of the concrete the stronger the concrete's breaking point. Most sidewalk are around 3500 PSI and driveways are around 4500 PSI. If you have any questions about what strength concrete you will need feel free to give us a call and ask. Concrete that doesn't go bad. Some jobs take longer then others, sometimes you can pour the concrete non stop off the truck to fill a hole but many times this is not the case. We have seen some jobs where they are pours the concrete a few hundred feet away from the truck and they need to wheel barrel it the entire way. With the traditional barrel truck this can cause a problem if the concrete is sitting in the truck for a long period of time. With the Zimmerman Mobile Mixers though we make the concrete fresh in the auger so if you have a job that will take a longer time you will still be getting fresh concrete throughout the entire pour. Just give us a call and let me know how long you will need the truck and we will help you complete your jobs. With November around the corner and the temperature dropping the question arises "is it too cold for concrete?". There are many things you can do to allow you to pour concrete in this cooler weather but the main thing is to be above 32 degrees. If it is above 32 degrees we can add an accelerator to the concrete to speed up the chemical reaction even in the cold weather plus we always use hot water in the trucks. Only other thing to watch for is if the temperature drops below 32 in the middle of the night. Small Concrete Pouring In Freehold, NJ. A contractor in Freehold, NJ contacted Quality Concrete to have 3 yards delivered for a sidewalk replacement job he was doing. No concrete delivery is too small for Quality Concrete. Contractors have used our services over the years to have small concrete pours delivered to their job sites. The day of the delivery, the Concrete Specialist arrived at the location on time, ready to assist the contractor in making sure the pour was quick and efficient. The drivers undergo weekly and monthly training sessions to ensure every customer has a great concrete experience. The pour was a success and the contractor was able to complete the job effectively. Pouring Footings In Holmdel, NJ. A contractor in Holmdel, NJ needed concrete to pour footings for one of his customers. It was a Saturday when he started calling companies to get some pricing for the pour. He was able to get in touch with the dispatcher at Quality Concrete. The dispatcher provided him with the pricing he needed, and scheduled the delivery for him right there and then. The day of the delivery, the concrete specialist arrived and started mixing the concrete right on site. The contractor got fresh, high quality concrete mixed at his convenience. He had to use wheel barrows to do the pour, but the drivers expertise helped make the delivery easy and effective. The contractor originally ordered 3 1/2 yards and the day of the delivery he only used 2. Since the concrete was mixed on site as the contractor needed it, no concrete was wasted and he only paid for the amount that he used. The contractor was able to successfully complete the job and was pleased with the service provided by Quality concrete. Pouring a Kitchen Floor In Middletown, NJ. A cater company in Middletown, NJ needed to pour a basement floor for one of their locations. The customer was looking for a local company to do the delivery for them, so they decided to call Quality Concrete after seeing one of their trucks on the road. When they contacted Quality Concrete, the dispatcher was able to give them a quote over the phone and scheduled the delivery at their convenience. The day of the delivery the concrete was mixed right on site. The right amount of fresh concrete was delivered for the customer in an effect and timely manner. The customer was able to remit payment to the Jay, the concrete specialist, right after the delivery was made. Quality Concrete drivers have credit card swipers that make it easy for customer to make credit card payments the day of the delivery. After the delivery was made, the customer was pleased with the service Quality Concrete provided, and really like that making a payment was quick and efficient. Pouring a Sidewalk in Asbury Park, NJ. A contractor in Asbury park, NJ was looking for concrete to be delivered fir him for a sidewalk he was working on. He had uses Quality Concrete before for another job, so he decided to contact them again to order concrete. The contractor needed a yard and a half for the sidewalk, 3500 PSI. When he contacted the dispatcher, she was able to look up his information and get him all set up for the delivery. Sean, the Concrete Specialist, arrived on time to do the delivery. The concrete was freshly made at the job site for the contractor, and payment was made easy for him because Quality Concrete drivers take cash, check, and credit card payments. At the end of the delivery, the contractor was very pleased with the outstanding service provided by the Quality Concrete team and their customer service. Small Concrete Delivery In Ocean Grove, NJ. A contractor in Ocean Grove, NJ was pouring a sidewalk and needed a small load of concrete delivered. He did some research on the web and he found the Quality Concrete website. He like the mobile mixer truck used to make the deliveries, and what he liked most was that he was able to schedule a small pour at his convenience. Jay, the Concrete Specialist, was out to make the delivery. When he arrived he starting mixing fresh concrete for the contractor right there and then. The contractor was able to pour the concrete right off the truck making the delivery run fast. He delivered one yard of 4000 PSI concrete with fiber. At the end of the, the contractor was able to pay the driver with his credit card and he got a receipt for the amount that was charged. The pour went well and the contractor was very pleased with the service that the Quality Concrete staff provided. Concrete Delivery In Matawan, NJ. A contractor in Monmouth County was doing a pour in Matawan, NJ and needed to have about 17 yards of concrete delivered to the job site. He was pouring around a pool area and was looking for a local company to come out and do the delivery for him. He came across the Quality Concrete website, saw that they were located in Cliffwood, NJ, and decided to call them to get a quote for the pour. Quality Concrete trucks hold 10 yards so the contractor would need 2 trucks for the delivery. When he called, the dispatcher gave him a price over the phone and booked the pour for him. Jay, the Concrete Specialist, contacted the contractor when he was on his way to the job site. When he arrived, he parked the concrete truck right in front of the property. The contractor was using wheel barrows to get the concrete out from the truck to the pool area. Jay started mixing fresh concrete and poured it into the wheel barrows for the contractor to bring over to the area they needed it. The contractor had 5 wheel barrows so the concrete was taken out of the truck in a timely manner. Jay brought a second truck to complete the pour and delivered a total of 14 yards of 3500 PSI Concrete. The contractor had originally ordered 17 yards, but only paid for the amount that he used the day of the delivery. At the end of the pour, the contractor was able to successfully complete the job and make his customer happy. A Contractor in Ocean Grove NJ, was looking to have concrete delivered for a small job he was working on. He needed about 2 yards of concrete delivered for a sidewalk. He contacted the Quality Concrete dispatcher to get some pricing and schedule a delivery. The day of the delivery, Sean, the Concrete Specialist called the contractor to let him know that he was on his way to the job site. When he arrived, he parked the truck right by the sidewalk and began to mix fresh concrete. The pour was right off the truck so the contractor got the concrete out in no time. When the pour was completed, the contractor was able to remit payment to the driver. The pour was a success and everyone was happy with the quality of the concrete and the experience provided by the Quality Concrete team. Pouring a Small Driveway Section In Keansburg, NJ. A contractor in Keansburg, NJ needed concrete to pour a small section of a driveway. He needed about 2 yards of 3500 PSI. He searched the web for different concrete companies in the area, and came across Quality Concrete. He saw that they were located right in Monhmouth County and decided to give them a call to get prices. The dispatcher gave him the information he needed, and scheduled a delivery for him. Jay, the Concrete Specialist, was assigned the duty to make the delivery. The dispatcher called the contractor the day before to confirm the pour, and Jay called him the day of the delivery to let him know that he was on his way to the job site. When he arrived at the location, he was able to park the truck right in front of the property. The contractor needed to used wheel barrows to get the concrete from the truck to the driveway section he was pouring. The contractor had 3 wheel barrows, so taking the concrete out of the truck was easy and was done in a timely manner. Jay delivered 1 1/2 yards of 3500 PSI. The contractor had originally ordered 2, but since the concrete was mixed right at the job site, the contractor only had to pay for the amount of concrete that was used. The job was successfully completed and the contractor was happy with the service provided by the staff from Quality Concrete. A contractor in Monmouth County, NJ was looking to have concrete delivered to pour walkways for one of his customers. He needed about 10 yards of 4500 PSI. The job was in Manalapan, NJ and the contractor wanted a local company to do the delivery for him. He saw one of the Quality Concrete trucks out on the road, he got their phone number, and decided to give them a call. When he spoke to the dispatcher, she let him know that Quality Concrete was located in Cliffwood, NJ so making the delivery to Manalapan, NJ was not a problem. The delivery was scheduled for 8:00 am. The dispatcher called the contractor the day before to confirm the pour, and Sean, the Concrete Specialist, called him the day of the delivery to let him know that he was on his way to the job site. The contractor was working at an apartment complex, so some of the concrete had to be poured into wheel barrows for the contractor's crew to bring over to the walkways. The rest of the pour, Sean was able to pour the concrete straight out of the truck. The contractor's crew and Sean worked together to make the pour as fast and efficient as possible. At the end of the delivery, the concrete was poured in a timely manner, and the job was successfully completed. The contractor was happy with the way the pour went, he was able to complete the job, and his customer was happy with the brand new walkways. Delivering Concrete To Fair Haven, NJ. A landscaping company based out of Freehold, NJ was in need of a concrete delivery in Fair haven, NJ for a walkway that they were pouring. 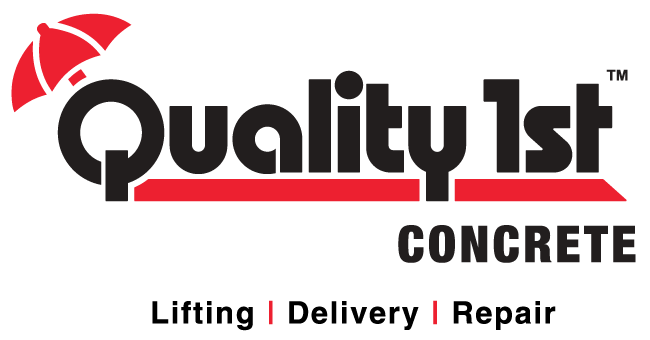 The landscaper did a web search looking for a local concrete company to make the delivery for him, and he came across Quality Concrete. He looked at their service area and saw that the plant was located in Monmouth County, so he decided to contact them to get a price and schedule the delivery. When he contacted them, the dispatcher helped him calculate the amount of concrete he would need for the walkway, provided him with a price, and scheduled the delivery for him. The dispatcher contacted the landscaper the day before the delivery to confirm, and Carlos, the Concrete Specialist, called him the day of to let him know that he was on his way to the job site. When Carlos arrived, the contractor had the area set up and ready to start the pour. Carlos was able to park by the walkway, got the chute right over the area they were pouring, and started making fresh concrete for the landscaper. The pour was quick and efficient. Carlos delivered 4 yards of 3500 PSI in a timely manner. At the end of the delivery, the landscaper successfully completed the job, and he was very satisfied with the service the Quality Concrete Team provided. Delivering Concrete To Farmingdale, NJ. A contractor in Monmouth County was looking for a concrete delivery in Farmingdale, NJ to pour a sidewalk. He had used Quality Concrete before to pour the first section of the sidewalk, was happy with the service, so he decided to contact them to get a second delivery. When he called the dispatcher, she was able to easily locate his information and schedule the delivery for him. Carlos, the Concrete Specialist was out to make the delivery for the contractor. When he arrived to the job site, he was able to park right by the sidewalk to start the pour. The contractor had the area ready so Carlos started making fresh concrete to pour the sidewalk slabs. The driver delivered 6 yards of 3500 PSI. The contractor had ordered 7 yards, but since Quality Concrete has the metered trucks, the contractor was charged only for the amount that he used and no concrete was wasted. At the end of the pour, the contractor was able to make a payment with the driver using his credit card, and got a receipt for the payment made. The delivery was a success and contractor's customer was very happy with their new sidewalks. Pouring Sidewalks In Neptune City, NJ. A contractor in Monmouth County needed a delivery out to Neptune City, NJ to pour sidewalks. He had used Quality Concrete for a previous job, so he decided to give them a call to place an order. When he contacted their office, the dispatcher was able to take all his information and get him on the calendar. Carlos, the Concrete Specialist, was out to make the delivery. Carlos contacted the contractor to let him know that he was on his way to the job site. When he arrived, the area was formed and ready, so he was able to park right in front of the sidewalk to start pouring. Carlos began to mix fresh concrete for the contractor. The contractor had ordered 6 yards for the delivery, and he only used 5 yards. Quality Concrete has the metered trucks, so the contractor was only charged for the amount of concrete that he used. Since the concrete was taken straight out of the truck, the pour was quick. At the end, Carlos successfully delivered 5 yards of 3500 PSI concrete, and the contractor was able to submit payment directly to the driver. The job was completed and everyone was happy with the service. Concrete Delivery In Howell, NJ. A contractor based out of Monmouth County needed a concrete delivery in Howell, NJ. He was pouring a driveway and needed about five yards of concrete. Searching the web, he came across the Quality Concrete website, saw they they were located in Monmouth County, and decided to give the a call to get a quote. When he called their office, the concrete coordinator took down all his information, provided him with a price, and scheduled the delivery for him. Carlos, the Concrete Specialist, was assigned the duty to deliver the concrete. The coordinator called the contractor the day before the delivery to confirm it, and Carlos, the driver, called the day of to let him know that he was on his way to the job site. When Carlos arrived, he parked right in front of the property, and was able to get the chute all the way out to the area the contractor was pouring. He slowly moved the chute back as the pour went along, and the concrete was taken straight out of the truck. Carlos delivered 5 yards of 4500 PSI. At the end of the delivery, the contractor was able to make a payment right there and then using his credit card, and got a receipt. The pour was a success, the contractor was able to complete the job in a timely manner, and was very happy with the service provided by the driver and the rest if the Quality concrete team. Delivering Concrete In Sea Girt, NJ. A contractor in Sea Girt, NJ was looking for a concrete delivery to complete a job he was working on. He was pouring a few sidewalks, and needed about 10 yards of concrete. He made a few calls to different companies in the area, and found Quality Concrete. When the contractor contacted their coordinator, she provided him with a quote over the phone, and booked the delivery for him. Carlos, the Concrete Specialist, was out to make the delivery. When Carlos arrived at the job site, he parked right in front of the sidewalk area and started making fresh concrete for the contractor. Quality Concrete has metered trucks that bring you the Right amount- Right on time so customer don't have to worry about over ordering. The crew at the job site took the concrete straight out of the truck, making the pour go a little quicker. Carlos delivered 10 yards of 4500 PSI Concrete in a timely manner. Payment was made easy for the contractor, they were able to provide a credit card number over the phone and payment was taken after the delivery was made. At the end pf the pour, the job was successfully completed, and the contractor was very pleased with the service provided by the Quality Concrete Team. Making A Concrete Delivery To Colts Neck, NJ. A contractor in Monmouth County needed 16 yards of concrete delivered to Colts Neck, NJ to pour a patio. He saw a Quality Concrete truck on the road, wrote down their number, and contacted them to get a quote. When the contractor called their office, the concrete coordinator provided him with a price over the phone and booked the delivery for him. Jay, the Concrete Specialist, was assigned the duty to make the delivery. When Jay arrived to the job site, the contractor and his crew were ready for him to start pouring. The concrete was made right on site. As opposed to barrel trucks, Quality Concrete has metered trucks that make it possible to have fresh concrete delivered every time, over ordering is avoided, and you only pay for the amount of concrete that you use. The contractor had to use wheel barrows to get the concrete out from the truck and to the patio. He had a few wheel barrows, so the pour went a little quicker then expected. At the end of the pour, the contractor used 13 yards instead of the 16 he had ordered. Only 13 yards of concrete were made, so he paid for the amount that he used. The contractor was able to remit payment to the driver by using his credit card right at the job site. The job was successfully completed, and the contractor was very happy with the outstanding service provided but the Quality Concrete team. Saturday Delivery In Middletown, NJ. A contractor in Middletown, NJ was looking to have a small concrete load delivered on a Saturday. He was looking for a reasonable price and excellent service. Doing some research on the web, he came across the the Quality Concrete website, saw that they were close to Middletown, so he decided to call them to get some information. When he contacted their office, he was very happy with the price and with how friendly and polite the concrete coordinator was so he booked the delivery. Sean, one of our senior Concrete Specialists, was out to make the delivery. The contractor was pouring a sidewalk so Sean was able to park right in front of the property to start the pour. Sean began to mix fresh concrete at the job site. This gives the contractor more time to work the concrete, as opposed to barrel trucks. The contractor used 3 yards of 3500 PSI concrete. The concrete was taken straight out of the truck, so the pour went by quick. At the end of the delivery, the contractor was able to remit payment directly to the driver, the job was completed in a timely manner, and everyone was happy with the service provided by the Quality Concrete tea. A contractor in Monmouth County needed a concrete delivery to pour a walkway in Asbury, NJ. He had used Quality Concrete before to deliver at this property, so he contacted them to place another order. When he called their office, the concrete coordinator was able to easily locate his information, and placed him on the calendar. Carlos, the Concrete Specialist, was out to make the delivery. The customer was pouring a walkway in the back of the house, but Carlos was able to back up the truck as close as possible to the area. From there the contractors used wheel barrows to get the concrete out of the truck. The concrete was mixed right at the job site, giving the contractor more time to work on the concrete. Carlos delivered 4 yards of 3500 PSI mix. At the end of the delivery, Carlos washed out the chute to make sure it was ready to be used at his next delivery. The contractor was able to pay the driver directly by using his credit card and got a receipt. The job was successfully completed and the contractor was very happy with the service provided by the Quality Concrete team. Small Concrete Delivery In Holmdel, NJ. A Contractor from Monmouth County needed a small concrete delivery to go out to Holmdel, NJ. He was pouring a small sidewalk, and was looking to have about 2 yards of concrete delivered. He had used Quality Concrete before, so he contacted their coordinator to schedule the pour. Jay, the Concrete Specialist, was out to make the delivery. When he arrived, the area was nicely framed out, and the crew was ready to start the pour. Jay began to mix fresh concrete for the contractor right at the job site. Since the sidewalk was in the front of the building, Jay was able to park right by the sidewalk, and pour the concrete straight out of the truck. The Concrete Specialist successfully delivered 2 yards of 4000 PSI. The contractor was able to remit payment directly to the driver, and got a receipt for it. At the end of the pour, the job was completed in a timely manner and the contractor was extremely satisfied with the professional cement service provided by the Quality Concrete Team. A contractor in Monmouth County needed a concrete delivery to pour a few footings in Matwan, NJ. He was looking for a local company to make the delivery, so he began to do some research on the web. He came across the Quality Concrete website, read a little bit about the company, saw that they were located in Cliffwood, NJ, and decided to contact them. When he called their office, he was very pleased with the customer service provided by the Concrete Coordinator. The Coordinator helped him calculate how much concrete he would need for the delivery, and let him know the exact price he would have to pay. Jay, the Concrete Specialist, was assigned to make the delivery. The Coordinator wrote out a ticket for Jay that had the address of the property, the amount of concrete the contractor needed, and his contact information. Jay checked, then loaded his truck to make sure that everything was good to go for the delivery. Before Jay left the concrete plant, he contacted the contractor to introduce himself and to let him know that he was on his way to the job site. When he arrived at the site, the contractor and his crew were ready to start the pour. Jay started making fresh concrete right there and then. He was able to back up to pour straight into some of the footings, and for the rest, the extension chute was used to get the concrete out of the truck. The extension chute gives contractors and homeowners an additional 10 feet in length to make it easier to get the concrete to the areas the truck can't back up to. The contractor had ordered 8.5 yards of concrete and used 9 the day of the delivery. Quality Concrete drivers always carry a little more concrete on the truck, so delivering the 9 yards was not a problem. At the end of the delivery, the contractor was billed only for the amount of concrete that was used, the job was successfully completed, and everyone was happy with the outstanding service provided by the Quality Concrete team. A contractor in Monganville, NJ was interested in making a concrete delivery. He was pouring a small concrete patio in the back yard, and needed about 3 yards of concrete. He saw a Quality Concrete truck on the road, wrote down their number, and decided to give them a call. When he called their office, the Concrete Coordinator gave him all the information he needed, got him on the calendar, and let him know exactly how much he would pay for the 3 yards. Ken, the Concrete Specialist, was assigned the duty to make the delivery. He loaded his truck, and before he left the concrete plant, he called the contractor to introduce himself and let him know that he was on his way to the job site. When Ken arrived, the contractor was ready to start the pour. Since there was no access for the truck to back up to the patio area, wheel barrows were used to get the concrete out of the truck. The concrete was mixed right at the job site offering more flexibility for the contractor and better quality. There was a short distance from the truck to the patio area, and the contractor had 3 wheel barrows, so the concrete was taken out the truck in a timely manner. Ken successfully delivered 3 yards of 4500 PSI. At the end of the pour, the contractor was able to pay the driver directly with a check. Quality Concrete drivers take credit, check, and cash payments. The job was completed, the contractor was very pleased with the professional service, and the homeowner was happy with their new patio. Saturday Delivery In Freehold, NJ. A Contractor in Freehold, NJ needed a concrete delivery to pour a sidewalk for one of their customers. He had used Quality Concrete before, so he decided to call them to place the order. When he called their office, the Concrete Coordinator easily located their file and scheduled the delivery for the 4 yards of concrete that the contractor calculated he would need. Sean, the Field Supervisor, was out to make the delivery. He prepped his truck and loaded it to make sure that everything was good to go for the pour. Sean contacted the contractor to introduce himself, and let him know that he was on his way to the job site. When he arrived, he was able to park right in front of the sidewalk to start the pour. The area was nicely framed out, so Sean began to mix fresh concrete right at the job site. This gives contractors more time to work on the concrete and finish it. 4 yards of 4000 PSI were successfully delivered. The contractor was able to remit payment directly to the driver, and received a receipt for the purchase. The job was completed, and the contractor was very pleased with the service provided by the Quality Concrete team. A contractor in Monmouth County was pouring a few slabs around a pool in Marlboro, NJ and needed concrete to be delivered. He was looking for a local company to make the delivery at an affordable price. He did some research on the web and found Quality Concrete, the Local Concrete Provider for the Monmouth County area. He contacted their office to get information and a prices per cubic yard. The Concrete Coordinator was able to provide him with all the information he needed, and schedule the delivery for him. Jay, the Concrete Specialist was in charge of the delivery. He checked, then loaded his truck to make sure that everything was good to go for the pour. Before Jay left the concrete plant, he called the contractor to introduce himself and inform him that he was on his way to the job site. The truck arrived on time, parked at the front of the house, and the delivery started. Fresh concrete was made right at the job site allowing more flexibility for the contractor and better quality. The driveway was not wide enough for the truck to back up to the pool area, so wheel barrows were used to transport the concrete to the back of the house. At the end of the delivery, the contractor only used 5 yards of the 8 that he ordered. Since the concrete was mixed on site as he needed it, only five yards of concrete were made. No concrete was wasted, and the best part is that the contractor only had to pay for the amount of concrete that he used. The job was successfully completed and the contractor was extremely pleased with the service provided by the Quality Concrete Team. A Bradley Beach, NJ contractor needed a small concrete delivery to pour a sidewalk for one of his customers. He had used Quality Concrete before, was very satisfied with their service, so he decided to call them to place the order. He contacted their office, and the Concrete Coordinator helped him get the order on the schedule. The Coordinator also let him know exactly how much he would pay for the 2 yards of 3500 PSI that he needed, and the payment methods accepted. Carlos, the Concrete Specialist, was in charge of making the delivery. He loaded his truck and proceeded to call the contractor to inform him that he was on his way to the job site. Carlos arrived to the job site on time and parked right in front of the sidewalk. The area was nicely formed out, and the crew was ready to start the pour. Fresh concrete was mixed right at the job site. The concrete was poured straight from the truck into the sidewalk area without a problem. Carlos used the levers on the concrete truck to move the chute form side to side to make sure that the entire area was covered in concrete. As he poured, one of the crew members floated, and finished the sections that were already filled with concrete. When he go to the end of the sidewalk and finished pouring, he washed the chute to make sure that it was ready to be used at the next delivery. He also filled out a receipt for the contractor and took payment for the delivery. At the end of the pour, the job was successfully completed, and the contractor was very satisfied with the service provided by the Quality Concrete Team. A Red Bank, NJ contractor was working on a new sidewalk and needed a small amount of concrete delivered. He had seen Quality Concrete trucks on the road before, but never wrote down their number. Searching on the web, he came across the Quality Concrete website, read a little bit about their service, and coverage area, so he decided to give them a call. When he contacted their office, the friendly Concrete Coordinator gave him all the pricing information and scheduled the delivery for him. Jay, the Concrete Specialist, was out to make the delivery. Jay checked his truck and made sure that it was loaded with the right amount of material for the pour. When Jay arrived at the job site, he was able to park right in front of the sidewalk to start the delivery. Fresh concrete was made for the contractor right there and then. This gives homeowners and contractors more time to work the concrete. Jay placed the chute right over the sidewalk area, and used the levers to move it from side to side to make sure the entire sidewalk was poured. The crew working at the job site floated and finished the concrete. At the end of the delivery, Jay successfully delivered 2 yards of 3500 PSI. The job was successfully completed, an the contractor was very pleased with the service provided by the Quality Concrete team. A contractor in Monmouth County was looking for a small concrete delivery to go out to Matawan, NJ to pour footings. He had used Quality Concrete before for another job, so he gave them a call to place the order. When he got in touch with the concrete coordinator, she easily located his information, and placed him on the calendar. Ken, the Concrete Specialist, was out to make the delivery. When Ken arrived, he was able to back up to the footings to start the pour. Fresh concrete was made at the job site, and poured into the footings. The concrete was taken out in a timely manner. Ken used the levers on the truck to move the chute from one footing to the other, eliminating the use of wheel barrows. The concrete was taken out of the truck in a timely manner. Once the delivery was completed, the contractor was able to make a payment using his credit card. Ken washed the chute to make sure that it was ready to be used at his next delivery. The job was successfully completed, and once again the contractor was extremely satisfied with the service provided by the Quality Concrete team. Contractors in the Monmouth County area have trusted Quality Concrete for many year to deliver concrete to their job sites. Quality Concrete has mobile mixer trucks that deliver fresh concrete to every job site. One contractor in Englishtown, NJ was looking for 3 yards of concrete to replace a sidewalk. He had seen a Quality Concrete truck on the road before, so he decided to call them to place his order. The contractor spoke to the concrete Coordinator, was very please with the customer service, so he booked the delivery. Jay, Senior Concrete Specialist, was out to make the delivery. The day of the delivery, Jay called the contractor to introduce himself, and inform him tat he was on his way to the job site. The sidewalk area was all set up when Jay arrived, so he began to mix fresh concrete right at the job site. Mixing the concrete on site offers more flexibility, and better quality for contractors and homeowners. The concrete was poured straight into the sidewalk area. As Jay poured, the crew at the job site floated and finished the concrete. At the end of the delivery, Jay washed the chute to ensure quality at the next delivery. The job was successfully completed, and the contractor was very satisfied with the service provided by the staff at Quality Concrete. A Contractor in Monmouth County was looking for a concrete delivery to go out to a cemetery in Neptune City, NJ. He had used Quality Concrete for a previous job, so he decided to call them to schedule a delivery. When the contractor contacted the Concrete Coordinator, she easily located his information and got him on the calendar. Carlos, Senior Concrete Specialist, was assigned to make the delivery. The morning of the delivery, Carlos contacted the contractor to introduce himself, and inform him that he was on his way to the job site. Once at the location, Carlos had to keep the truck on the cemetery concrete path. He began to make fresh concrete right there ad then. As the concrete was made, the crew working there used a little machine to transport the concrete from the truck to the area they needed it. The delivery was for 2 yards of 4500 PSI. The concrete was taken out in a timely manner, and when the delivery was completed, Carlos washed the chute to ensure quality at his next delivery. The job was a success and the contractor was extremely satisfied with the service. A contractor in Monmouth County was looking for a small concrete delivery to go out to Eatontown, NJ for a slab that he was working on. He called around to get prices and came across Quality Concrete. He decided to contact them to get some information, was very pleased with their customer service, and decided to book the delivery for 2 yards of 4000 PSI. Carlos, Senior Specialist, was assigned the duty to make the delivery. The morning of the delivery, Carlos loaded his truck, and before he left the plant, he contacted the contractor to inform him that he was on his way to the job site. When Carlos arrived, the area was nicely framed out, and the crew was ready to start the pour. Carlos backed up as close as possible to the slab area, and extended the chute. The chute was placed right above the framed out area to pour the concrete directly into it, avoiding the use of wheel barrows. Fresh concrete was mixed right there and then allowing more flexibility and better quality. At the end of the pour, the contractor only used 1 1/2 yards of the 2 that he ordered. Since Quality Concrete uses metered trucks to make the deliveries, only 1 1/2 yards were made, and the contractor paid only for the amount of concrete used during the pour. The job was successfully completed, and the contractor was very satisfied with the service provided by Quality Concrete. A Contractor in Little Silver, NJ was pouring a sidewalk and needed a few yards of concrete. He had used Quality Concrete before, was very satisfied with their service, so he decided to contact them to book the delivery. When he called in, the Concrete Coordinator easily located his information and got him on the calendar. Carlos, Senior Specialist, was in charge of making the delivery. He prepped, and checked his truck to make sure that everything was ready to go. On his way to the job site, he contacted the contractor to inform him that he was on his way there. The contractor let Carlos know that they were ready to pour. Carlos arrived, and parked right in front of the sidewalk. He go out of the truck, placed the chute right over the sidewalk, and began to mix fresh concrete. The concrete was poured right onto the framed out area, avoiding the use of wheelbarrows. As he poured, the crew working at the property floated, finished, and edged the sidewalk. 3 yards of 4000 PSI were successfully delivered. At the end of the pour, the contractor was able to remit payment directly to the driver. The job was completed in a timely manner, and once again the contractor was highly satisfied with the service provided by Quality Concrete. A contractor in Monmouth County was looking for a Saturday delivery to pour a few concrete slabs at a farm in Marlboro, NJ. He needed about 20 yards of concrete to be delivered on a Saturday. He had used Quality Concrete before, so he contacted them to place the order. When he contacted the Concrete Coordinator, she easily located his information, and scheduled the delivery for him. Sean, the Field Supervisor, was in charge of making the delivery. The day before the delivery, Sean fully loaded his truck to make sure that everything was set for the next day. The day of the delivery, Sean contacted the contractor to introduce himself, and inform him that he was on is way to the job site. Once at the location, the truck was parked right in front of the framed out areas to start the pour. Fresh concrete was mixed right at the job site offering more flexibility and better quality. After the first 10 yards of concrete were delivered, Sean drove back to the concrete plant to reload his truck and brought the additional 10 yards over to the farm. As the concrete was being poured, the crew at the job site floated and finished the concrete. 20 yards of 4000 PSI were successfully delivered and the job was completed. At the end of the delivery, the contractor was able to remit payment directly to the driver using his credit card. The pour went really well and the contractor was extremely pleased with the service provided by Quality Concrete. A contractor in Monmouth County was pouring a small section of a sidewalk and needed concrete delivered. He needed about a yard of concrete, and was having difficulty finding a company who would deliver the small amount of concrete that he needed. He searched the web and came across the Quality Concrete website. He contacted their office, and the concrete coordinator informed him that making the delivery would not b a problem. She collected all the information needed for the delivery, and scheduled the pour. Ken, the Concrete Specialist, was out to make the delivery. Before Ken left the concrete plant, he contacted the contractor to introduce himself, and informed him that he was on his way to the property. Once at the job site, Ken parked the concrete truck right in front of the framed out sidewalk. The contractor and the crew were ready to start the pour, so fresh concrete was mixed for them right there and then. As the concrete was poured, the crew floated and finished the concrete. Once all the concrete was taken out of the truck, Ken washed the concrete chute to ensure quality at his next delivery. At the end of the pour, the contractor paid the driver directly. The job was successfully delivered, and the contractor was very please with the service. A contractor in Monmouth County was looking for a concrete delivery to go out to Colts Neck, NJ. He was pouring a footing and needed about a yard of concrete. Most of the companies that he contacted did not make small deliveries, so he went online searching for a company that would. He came across the Quality Concrete website and read about their services. He saw that they made small deliveries and decided to reach out to them. When he was on the phone with their Concrete Coordinator, she informed him that making the delivery would not be a problem, and scheduled the pour. Ken, the Concrete Specialist was in charge of making the delivery. He loaded his truck the night before, and made sure that everything was set for the next morning. The day of the delivery, Kenny contacted the contractor to introduce himself, and to inform him that he was on his way to the job site. When Kenny arrived, he was able to back the truck up as close as possible to the footing. He then proceeded to get out of the truck so he could start the pour. Fresh concrete was mixed right there and then and poured directly into the footing. Once all the concrete was out of the truck, the chute was washed to ensure quality at the next delivery. At the end of the delivery the contractor was able to remit payment directly to the driver. The job was successfully completed, and the contractor was very pleased with the service provided by the Quality Concrete Team. A contractor in Monmouth County was pouring footings in Holmdel, NJ and needed about 2 yards of concrete to be delivered. He called a few companies to book the pour, but they did not deliver small amounts of concrete. He searched the web, and he found the Quality Concrete website. He contacted their office, and the Concrete Coordinator informed him that making the delivery would not be a problem. She collected all the information needed for the poured and scheduled it. Sean, the Field Supervisor, was in charge of the delivery. Before he went out to the job site, he checked, then prepped his truck to make sure everything was set for the delivery. He also contacted the contractor to inform him that he was on his way. Once at the job site, Sean was able to back up straight to the footing. He began to mix fresh concrete and poured it directly into the footing. When all the concrete was taken out of the truck, the chute was washed out to ensure quality at the next job site. At the end of the delivery, the contractor only used 1 1/2 of the 2 yards that he ordered. Since Quality Concrete uses mobile mixer trucks only 1 1/2 yards of concrete were made, and the contractor only paid for the amount that was used. The delivery was a success, and the contractor was very pleased with the service provided by Quality Concrete. A contractor in Atlantic Highlands, NJ was pouring a small dumpster slab and needed concrete delivered. he contacted a few companies, but they didn't make small concrete deliveries. He searched the web and found the Quality Concrete website. On the website he read about their services and coverage area. He gave them a call to get prices and information, and during the call, the Concrete Coordinator informed him that making the delivery was not a problem. Carlos, Senior Concrete Specialist, was out to make the delivery. When Carlos was on his way to the job site, he called the contractor to introduce himself and inform him that he was on his way there. Once at the job site, Carlos parked right in front of the framed out slab. He got out of the truck, and placed the chute right over the slab so he could start the pour. Fresh concrete was mixed right there and then, and poured directly into the slab. As Carlos was pouring, the crew at the job site took care of floating and finishing the concrete. At the end pf the delivery the chute was washed out to ensure quality at his next delivery. The job was successfully completed, and the contractor was very pleased with the service provided by the staff at Quality Concrete. A contractor in Freehold, NJ was pouring a sidewalk and needed concrete delivered. He had used Quality Concrete before, was very pleased with their service, so he decided to give them a call. When he contacted their office, the Concrete Coordinator collected all the information needed for the pour and got him on the calendar. Ken, the Concrete Specialist, was out to make the delivery. He loaded his truck and contacted the contractor before he left the concrete plant to inform him that he was on his way to the job site. When Ken arrived, he got out of the truck and introduced himself. The contractor showed him the area that they were pouring so Ken parked right in front of it. The chute was extended out and placed right over the sidewalk area. Fresh concrete was mixed right at the job site and poured directly into the framed out sidewalk. As the concrete was poured, the crew floated the concrete. The contractor had ordered 4 yards on concrete and only used 3 1/2. With the effective mobile mixers only 3 1/2 yards of concrete were made, so the contractor only paid for that amount. The contractor was able to remit payment directly to the driver using his credit card. The job was successfully completed and the contractor was very pleased with the service provided by Quality Concrete. A Mason in Monmouth County was pouring a slab at a car wash in Spring Lake, NJ and needed concrete delivered. He had used Quality Concrete before, was very pleased with their service, and decided to give them a call. When he contacted their office, the Concrete Coordinator collected all the information needed for the pour and scheduled the delivery. Carlos, Senior Concrete Specialist, was in charge of making the delivery. He contacted the contractor before he left the concrete plant to inform him that he was on his way. When Carlos arrived, the slab was nicely framed out, and the crew was ready to start the pour. Carlos was able to back the truck up to the slab and poured directly into it. Fresh concrete was made right at the job site, and as it was being poured into the slab, the crew floated and finished the concrete. 7 yards of 4000 PSI were delivered in a timely manner. Once all the concrete was out, the chute was rinsed and washed to ensure quality at the next delivery. The job was successfully completed, and the contractor was very pleased with the service provided by the staff at Quality Concrete. A contractor in Monmouth County was pouring a driveway and needed about 20 yards of concrete to be delivered to Eatontown, NJ. He had used Quality Concrete before, was very pleased with their service, so he decided to called their office to book the pour. When he called, the Concrete coordinator collected all the information for the delivery and got him on the calendar. Jay, Senior Concrete Specialist, was in charge of making the delivery. He fully loaded his truck to make sure that everything was ready to go first thing in the morning. The next day, Jay contacted the contractor before he left the concrete plant to inform him that he was on his way to the job site. When Jay arrived, he parked in front of the property and proceeded to get out of the truck to introduce himself. The crew working at the site was ready to pour so Jay began to mix fresh concrete right there and then. The concrete was poured into wheel barrows and brought over to back end of the driveway. As they got closer to the front of the driveway, less wheel barrows were needed to transport the concrete. Once the first 10 yards were delivered, Jay washed the chute and drove back to the concrete plant to reload his truck and bring the contractor the additional 10 yards that he needed. At the end of the delivery only 18 yards were used. With the metered truck only 18 yards of concrete were made so the contractor paid only for the amount of concrete that was used, and no material was wasted. The job was successfully completed, and once again the contractor was very pleased with the outstanding service provided by Quality Concrete. A contractor in Keyport, NJ was pouring a walkway for one of his customers and needed a few yards of concrete to be delivered. He had used Quality Concrete before, so he contacted their office to book the delivery. When he called them, the Concrete coordinator helped him calculate how much was needed for the pour, gave him a price over the phone, and scheduled the delivery. Jay, Senior Concrete Specialist, was in charge of making the delivery. The day of the pour, Jay checked and prepped his truck to make sure everything was set before he left the concrete plant. He also contacted the contractor to inform him that he was on his way to the job site. Once at the site, Jay parked his truck and got out to introduce himself and start the pour. Fresh concrete was made right there and then offering more flexibility and better quality. Wheel barrows were use to transport the concrete from the truck to the framed out walkway on the side of the house. Two crew members brought the concrete over to the walkway, and the other two took care of floating and finishing the concrete. At the end of the delivery, the chute was washed out to ensure quality at the next delivery. The contractor was able to remit payment directly to the driver using his credit card. The job was successful completed, and the contractor was very pleased with the service provided by Quality Concrete. A contractor in Monmouth County was pouring a small sidewalk for one of his customers and needed about two yards of concrete to be delivered to Holmdel, NJ. He had used Quality concrete before for a previous job, and decided to give the, a call to schedule the delivery. When he contacted their office, the Concrete Coordinator collected all the information needed for the delivery and got him on the calendar. Sean, The Field Supervisor, was out to make the delivery. He contacted the contractor to inform him that he was on his way to the job site and give him an estimated time of arrival. When Sean got to the job site, he parked right in front of the framed out sidewalk and got out of the truck to introduce himself. The crew at the site was ready to pour so fresh concrete was mixed for them right there and then. The chute was placed right over the sidewalk area and the concrete was poured directly into it. As the concrete was poured, the crew floated and finished the concrete. When all the concrete was taken out of the truck, Sean washed the chute to make sure that it was ready to be used at his next delivery. 2 yards of 3000 PSI were successfully delivered. The job was completed in a timely manner and the contractor was once again very pleased with the service provided by Quality Concrete. A contractor in Monmouth County was pouring a sidewalk and needed concrete to be delivered. He calculated that he would need about 10 yards of concrete. He had used Quality Concrete before so he contacted their office to schedule the delivery. When he called their office, the concrete coordinator helped him calculate the amount of concrete that he needed for the pour, gave him a price over the phone, and collected all the information needed for the pours. The delivery was scheduled and the proper arrangements were made to get the concrete out to the job site. Jay, Senior Concrete Specialist, was in charge of making the delivery. Jay fully loaded his truck and made sure that everything was set for the delivery. Before Jay left the concrete plant, he contacted the contractor to inform him that he was on his way to the job site. Once at the site, the concrete truck was parked in front of the framed out sidewalk. The crew was ready to start the pour, so fresh concrete was mixed for them right there and then. The chute was placed right above the sidewalk area and the concrete was poured directly into it. As the concrete was poured, the crew floated and finished the concrete. When all the concrete was taken out of the truck, Jay washed it out to make sure it was ready to be used at his next delivery. The job was successfully completed, and the contractor was very pleased with the service provided by Quality Concrete. A contractor in Monmouth County was pouring a basement floor and needed concrete to be delivered to Keyport, NJ. The contractor had used Quality Concrete before so he decided to contact them to schedule the pour. When he called their office, the Concrete Coordinator provided him with a price over the phone, and collected all the information needed to schedule the delivery. Carlos, Senior Concrete Specialist, was in charge of making the delivery. Carlos loaded his truck, and contacted the contractor before he left the concrete plant to inform him that he was on his way to the property. When Carlos arrived, he got out of the truck to introduce himself. He proceeded to back up into the driveway as close as possible to one of the basement windows so that they could start pouring. The chute on the concrete truck was extended out, and the extension chute was placed through the basement window. Fresh concrete was mixed right at the job site, and poured into the extension to get the concrete down to the basement floor. Once the concrete went down the extension chute, the crew at the site used wheel barrows to transport the concrete to the far end section of the basement floor. When all the concrete was taken out of the truck, both chutes were washed out to ensure quality at the next delivery. 9 yards of 4500 PSI were successfully delivered. The job was completed in a timely manner, and the contractor was very pleased with the service provided by Quality Concrete. A contractor in Monmouth County was pouring a footing and needed concrete to be delivered. He was referred to Quality Concrete by one of his colleagues so he decided to call their office to get a quote. When he called their office, the Concrete Coordinator gave him a price over the phone, collected all the information needed for the delivery, and got him on the calendar. Jay, Senior Concrete Specialist, was in charge of making the delivery. When Jay was on his way to the job site, he contacted the contractor to inform him that he was on his way to the job site. Once at the site, Jay was able to back up as close as possible to the footing. He extended the chute and began to mix fresh concrete right there and then. The concrete was poured directly into the footing avoiding the use of wheel barrows. The contractor had ordered 6 yards of 3500 PSI, but at the end of the delivery he ended up using 7. Quality Concrete drivers carry a little extra material on their trucks, so making the 7 yards was not a problem. At the end of the pour, the contractor was able to pay the driver directly using his credit card. The job was successfully completed, and the contractor was very pleased with the service provided by Quality Concrete. A contractor in Monmouth County was looking for a concrete delivery for a set of steps that he was pouring. He was looking for a local contractor to make the delivery, so he went online looking for a concrete company. He came across the Quality Concrete website and saw that they were located in Monmouth County. He contacted their office to get a quote and more information about their services. When he was on the phone with their Concrete Coordinator, she provided him with a price over the phone, and collected all the information needed for the pour. Carlos, Senior Concrete Specialist, was out to make the delivery. Carlos loaded his truck and contacted the contractor before he left the concrete plant to inform him tat he was on his way to the job site. When Carlos arrived, the area that was being poured was framed out and ready. Carlos parked right in front of the steps and extended the concrete chute out. Fresh concrete was mixed right there and then and poured directly into the steps. Once all the concrete was out of the truck, the chute was washed out to ensure quality at the next delivery. At the end of the pour, the contractor was able to remit payment directly to the driver. The job was a success and the contractor was very pleased with the service provided by Quality Concrete. A contractor in Marlboro, NJ was pouring a few slabs around a pool area and needed concrete to be delivered. He only needed about 2 yards of concrete and was having a hard time finding a company that would deliver that amount. He went on the web searching for a company that would, and he came across the Quality 1st Concrete Website. He decided to give them a call to get information and schedule a delivery. When he called, the Concrete Coordinator provided him with a price over the phone and got him on the calendar. Ken, the Concrete Specialist was in charge of making the delivery. He loaded his truck with enough material to make 2 yards of concrete. Before Ken left the concrete plant he contacted the contractor to give him an estimated time of arrival. When Ken arrived at the job site, the slabs that needed to be poured were ready and nicely framed out. Ken began to mix fresh concrete right there and then. The concrete was poured into wheelbarrows and transported to the pool area. At the pool area, two crew members were floating and finishing the concrete. When the pour was completed, the chute was rinsed to ensure quality at the next delivery. All the concrete was taken out in a timely manner and the job was successfully completed. A contractor in Monmouth County was pouring a new basement floor and needed concrete delivered to Keansburg, NJ. He calculated that he needed about 14 yards of concrete, so he started calling around to get prices. Searching the web, he came across the Quality 1st Concrete website. He read about their services, saw that they were located in Monmouth County, and decided to give them a call. When he contacted their office, the Concrete Coordinator gave him a price over the phone, and got him on the calendar. The day of the delivery, Senior Concrete Specialist Jay, was in charge of bringing the 14 yards over to the job site. Jay made sure to fully load his truck, and before he left the concrete plant, he contacted the contractor to inform him that he was on his way to the property. When Jay arrived, he was able to pull in to the driveway, and back up as close as possible to the basement. The extension chute was placed through one of the basement windows so the concrete floor could be poured. Fresh concrete was mixed right there and then, and poured into the extension chute. Once the concrete came down the chute, the crew at the site used wheel barrows to get the concrete over to the back section of the floor. Once the first 10 yards of concrete were delivered, the concrete chute was washed out to ensure quality. Jay drove back to the concrete plant to reload, and bring the additional 4 yrs that the contractor needed. At the end of the pour, the contractor only used 12 yards of the 14 that he ordered. With the mobile mixer truck, only 12 yards of concrete were made, so the contractor only paid for the amount that he used. The job was successfully completed, and the contractor was very pleased with the service provided by Quality 1st Concrete. A contractor in Monmouth County was pouring a small sidewalk and needed concrete to be delivered. He had use Quality 1st Concrete before, so he decided to give them a call. When he contacted their office, the Concrete Coordinator easily located his file. The coordinator also collected all the information needed for the new delivery and got him on the calendar. Sean, the Field Supervisor, was out to make the delivery. He had enough material to go from his previous pour, to the Colts Neck, NJ location so he contacted the contractor to inform him that he was on his way. When Sean arrived at the job site, he parked right in front of the framed out sidewalk. He extended the chute and placed it right above the area that had to be poured. Fresh concrete was mixed right there and then, and poured directly into the sidewalk. As the concrete was being poured, the crew at the job site floated, finished, and edged the concrete. At the end of the delivery the contractor was able to remit payment directly to the driver, and the chute was washed out to ensure quality at the next delivery. The job was successfully delivered, and the contractor was once again very pleased with the service provided by Quality 1st Concrete. A contractor in Hazlet, NJ was pouring a small concrete slab and needed about a yard of concrete to be delivered. He had used Quality 1st Concrete before, was very pleased with their service, so he decided to contact their office to schedule the pour. When he called their office, the Concrete Coordinator collected all the information needed for the delivery and got him on the calendar. Sean, the Field Supervisor, was in charge of making the delivery. The contractor only needed about a yard of concrete, but that was no problem. The Quality 1st Concrete trucks carry all the ingredients needed to make concrete, and they are mixed right at the job site making sure that every customer gets the freshest concrete available. Once at the site, the concrete was poured into wheel barrows so it could be transported to the back of the building where the slab had to be poured. The concrete was taken out in a timely manner, and the chute was rinsed out to ensure quality at the next delivery. The contractor was also able to remit payment directly to the driver, and got a receipt for his purchase. The job was successfully completed, and the contractor was once again very pleased with the service provided by the Quality 1st Concrete team. A contractor in Long Branch, NJ was pouring a few footings for one of his customers and needed a concrete delivery. He was looking for a local concrete supplier to make the pour. He had seen a Quality 1st Concrete truck on the road before, wrote down their number, and contacted them to get information. When he called them, he was very pleased with their customer service so he went ahead and booked the pour. Carlos, Senior Concrete Specialist was assigned to make the delivery. Carlos made sure to fully load his truck so he could bring 10 Yards of concrete over to Long Branch, NJ. When Carlos was on his way to the job site, he contacted the contractor to provide him with an estimated time of arrival. Once at the property, Carlos was able to back up the concrete truck as close as possible to the footings. The chute was extended out and placed right above the first footing. Fresh concrete was mixed right there and then, and poured directly into the footing. After the first footing was done, the levers were used to move the concrete chute to the next footing and so on. After all the concrete was taken out of the truck, the chute was washed out to ensure quality at the next delivery. At the end of the pour, the contractor was able to remit payment directly to the driver using his credit card. The job was successfully completed, and the contractor was very pleased with the outstanding service provided by the Quality 1st Concrete team. A contractor in Monmouth County was in need of a concrete delivery for a pool deck that he was pouring. He had used Quality 1st Concrete before so he decided to give them a call. He calculated that he would need about 2 yards of concrete. When he called their office, the Concrete Coordinator easily located his file and collected the information needed for the new delivery. Ken, the Concrete Specialist, was in charge of making the delivery. Before Ken left the concrete plant, he contacted the contractor to inform him that he was on his way to the property. When Ken arrived, he parked right in front of the property and got out of the truck to introduce himself. The contractor showed him where the concrete had to be poured. Fresh concrete was mixed right there and then. Wheelbarrows were used to transport the concrete from the truck to the pool area. Two crew members transported the concrete and the other two floated and finished it. Once all the concrete was taken out of the truck the concrete chute was rinsed out to ensure quality at the next job. When the pour was completed, the contractor was able to make a payment directly to the driver using his credit card. The job was completed in a timely manner, and the contractor was very happy with the service provided by the Quality 1st Concrete team. A Contractor in Monmouth County was pouring a few footings and needed concrete to be delivered to Neptune City, NJ. He was looking for a local supplier to come out and make the delivery at an affordable price. He went online looking for a company and came across the Quality 1st Concrete website. He decided to contact their office to get information and schedule the delivery. When he called them, the Concrete Coordinator provided him with a price over the phone and collected all the information needed to make the delivery. Ken, the Concrete Specialist, was in charge of making the delivery. He loaded his truck the day before and made sure that everything was set for the delivery. The next morning, Ken made sure to contact the contractor to introduce himself and inform him that he was on his way to the job site. Once at the property, Ken was able to back up to the footings. The chute was extended out and placed above the area that had to be poured. Fresh concrete was mixed right there and then, and poured directly into the footings. After all the concrete was taken out of the truck, the chute was washed out to ensure quality at the next delivery. The job was completed in a timely manner. The contractor was able to remit payment directly to the driver and got a receipt for his purchase. The pour was a success and the contractor was very happy with the service provided by the Quality 1st team. A contractor in Monmouth County was pouring a small concrete slab and needed concrete delivered to Matawan, NJ. He has used Quality 1st Concrete before, so he decided to call their office to schedule the delivery. When he called, the Concrete Coordinator easily located his file. The Coordinator assisted him in calculating how much concrete he would need for the pour, and collected all the information for the new delivery. Ken, the Concrete Specialist, was out to make the delivery. The day of the pour, Ken made sure to contact the contractor to inform him that he was on his way to the job site. When Ken arrived at the property, the slab was already framed out, and the crew was ready to start the pour. The chute was extended out and placed right above the slab. Fresh concrete was mixed right there and then offering more flexibility and better quality. As the concrete was being poured, the crew floated and finished the concrete. The concrete was taken out of the truck in a timely manner, and the chute was washed out to ensure quality at the next delivery. At the end of the pour, the contractor was able to pay the driver directly using his credit card. The job was a success, and the contractor was very pleased with the service provided by Quality 1st Concrete. A contractor in Monmouth County was pouring a sidewalk in Ocean Grove, NJ and needed concrete to be delivered. He has used Quality 1st Concrete before, so he contacted them to schedule the delivery. When he called their office, the Concrete Coordinator easily located his file. She collected all the information for the new delivery and got him on the calendar. Sean, the Field Supervisor, was in charge of making the delivery. Sean loaded his truck and made sure that everything was set for the pour. Before Sean left the concrete plant, he contacted the contractor to inform him that he was on his way to the job site. When Sean arrived, the area that had to be poured was ready and nicely framed out. The truck was parked in front of the sidewalk, and the chute was extended out to start the pour. Fresh concrete was mixed right at the job site and poured directly into the sidewalk. As the concrete was being poured, the crew at the sight floated and finished the concrete. After all the concrete was taken out of the truck the chute was rinsed out to ensure quality at the next delivery. The job was completed in a timely manner. The pour was a success and the contractor was once again very pleased with the service provided by Quality 1st Concrete. A contractor in Monmouth County was pouring a small footing and needed a yard of concrete to be delivered. He had used Quality 1st Concrete before, so he decided to call them to schedule the delivery. When he contacted their office, the Concrete Coordinator informed him that making the delivery would not be a problem. She collected all the information needed for the pour and got him on the calendar. Jay, Senior Concrete Specialist, was in charge of making the delivery. Before Jay left the concrete plant, he contacted the contractor to inform him that he was on his way to the job site. Once at the site, Jay parked the truck right in front of the property. Fresh Concrete was mixed right at the job site and poured into a wheelbarrow, and then transported to the footing. The concrete was taken out of the truck in a timely manner, and one yard of 4000 PSI was successfully delivered. The contractor was able to remit payment directly to the driver, and got a receipt for his purchase. The job was completed and the contractor was very pleased with the service provided by the Quality 1st Concrete team. A contractor in Monouth County was pouring a few footings and needed about 5 yards of concrete to be delivered to Middletown, NJ. He contacted a few companies to get price and he came across Quality 1st Concrete. He called their office and the Concrete Coordinator provided him with a quote over the phone. She also assisted him in calculating how much concrete he would need for the delivery and scheduled the pour for him. Carlos, Senior Concrete Specialist, was in charge of making the delivery. Carlos loaded his truck and made sure to call the contractor when he was on his way to the job site. When Carlos arrived, he was able to back up into the driveway. He extended the concrete chute out and placed it above the first footing. He then began to mix fresh concrete and poured it directly into the footing. After the first one was done, Carlos moved the chute to the next footing and so on. He successfully delivered 5 yards of 4500 PSI. When all the concrete was finally out of the truck, the chute was washed out to ensure quality at the next delivery. At the end of the pour, the contractor was able to remit payment directly to the driver. The job was completed in a timely manner, and the contractor was very pleased with the service provided by Quality 1st Concrete. A contractor in Howell, NJ was pouring a walkway and needed 2 yards of concrete to be delivered. He had used Quality 1st Concrete before, so he decided to contact them to place the order. When he called their office, the Concrete Coordinator easily located his file. She also collected all the information needed for the new pour and got him on the calendar. Carlos, Senior Concrete specialist, was out to make the delivery. The contractor only needed 2 yards of concrete, and he had enough material in his truck to go from his current pour over to the Howell, NJ pour. When Carlos was on his way, he contacted the contractor to provide him with an estimated time of arrival. When Carlos arrived, he parked the truck and got out to introduce himself. The crew at the site was ready to start the pour so fresh concrete was mixed for them right there and then. The concrete was poured into wheelbarrows and then brought over to the framed out walkway where thew crew members floated and finished the concrete. When all the concrete was taken out of the truck, the chute was rinsed out to ensure quality at the next job site. Carlos successfully delivered 2 yards of 3000 PSI concrete. After the pour was completed, the contractor was able to remit payment directly to the driver using his credit card. The pour was done in a timely manner and the contractor was very pleased with the service provided by Quality 1st Concrete. A homeowner in Long Branch, NJ was having work done in his basement and needed a new concrete floor to be poured. He was looking for a local contractor to deliver the concrete he needed, so he went online looking for a concrete supplier. Searching the web, he came across the Quality 1st Concrete website. He decided to call them to get a quote and some information. When he called their office, the Concrete Coordinator provided him with a price over the phone and scheduled the delivery for him. Jay, Senior Concrete Specialist, was in charge of making the delivery. Jay fully loaded his truck, and made sure that everything was set for the pour. He also loaded the extension chute to make it easier for the contractor to get the concrete down to the basement area. When Jay was on is way to the job site, he contacted the homeowner to provide him with an estimated time of arrival. Once at the property, Jay was able to back up into the driveway to get closer to the basement. He unloaded the chute and placed it through one of the basement windows. Fresh concrete was mixed right at the job site, and then poured into the extension. Inside the basement, two crew members had wheel barrows ready to transport the concrete from the chute to the back end of the basement floor. The concrete was taken out of the truck in a timely manner. After all the concrete was taken out, both chutes were rinsed out to ensure quality. The homeowner was able to pay the driver directly using his credit card and got a receipt for his purchase. The job was a success, and the homeowner was very pleased with the service provided by Quality 1st Concrete. A contractor in Freehold, NJ was pouring a garage slab for one of his customers and needed concrete to be delivered. He had used Quality 1st Concrete before so he decided to call them to place the order. When he called their office, the contractor provided the Concrete Coordinator with the new address of the job site and scheduled the pour. Jay, Senior Concrete Specialist, was out to make the delivery. When he was on his way, Jay called the contractor to provide him with an estimated time of arrival. Once at the site, Jay backed up the truck into the driveway to get closer to the garage area. He extended the concrete chute out, and placed it right above the framed out floor. Fresh concrete was mixed right at the job site and poured directly into the garage floor. As the concrete was being poured, the crew at the site floated and finished it. Once the delivery was completed, the chute was rinsed out to ensure quality, and the contractor was able to remit payment directly to the driver. 10 yards of 5000 PSI were successfully delivered. The job was completed in a timely manner and the contractor was very pleased with the service provided by Quality 1st Concrete. A contractor in Monmouth County was pouring a sidewalk and a driveway and needed concrete to be delivered to Hazlet, NJ. He was looking for a local contractor to come out and make the delivery at an affordable price. He went on the web searching for a company, and came across the Quality 1st website. He saw that they were located a few minutes away from his job site, so he decided to call them to place the order. When he called their office. The Concrete Coordinator collected all the information needed for the pour, and booked the delivery. Jay, Senior Concrete Specialist, was out to make the delivery. Before Jay left the concrete plant, he contacted the contractor to inform him that he was on his way to the job site. When Jay arrived, the crew at the site was ready to start the pour. The sidewalk was nicely framed out, so the chute was extended out and placed right above the sidewalk. Fresh concrete was mixed for the contractor right there and then. The levers on the truck were used to move the chute along the sidewalk to make sure that the entire area was covered in concrete. As the concrete was being poured, the crew floated, edged, and finished the concrete. At the end of the pour 4 yards of 3500 PSI concrete were successfully delivered, and the contractor was able to remit payment directly to the driver using his credit card. The job was completed in a timely manner, and the contractor was very pleased with the service provided by the Quality 1st Concrete team. A contractor in Monmouth County was pouring a walkway for one of his customers and needed concrete to be delivered to Middletown, NJ on a Saturday. He had used Quality 1st Concrete before, so he decided to call them to schedule the delivery. When the contractor called the office, the Concrete Coordinator located his file, and collected the new information needed for the pour. Sean, the Field Supervisor, was in charge of making the delivery. He loaded his truck the night before and made sure that everything was set for the delivery. The next morning, Sean contacted the contractor to introduce himself, and inform him that he was on his way to the job site. When Sean arrived, the crew was ready to start the pour. The truck was parked in front of the property and the chute was extended out. Fresh concrete was mixed right at the job site and poured into wheelbarrows. With the wheelbarrows, the concrete was transported from the truck to the walkway area. As the concrete was being poured, two crew-members floated and finished the concrete. After the pour was completed, the chute was rinsed out to ensure quality at the next delivery. The contractor was able to remit payment directly to the driver using a check, and got a receipt for his purchase. The job was completed in a timely manner, and the contractor was very pleased with the service provided by Quality 1st Concrete. A contractor in Monmouth County was pouring a sidewalk for a customer in Keansburg, NJ and needed concrete to be delivered. He had used Quality 1st Concrete before, so he contacted them to schedule the delivery. When he called, the Concrete Coordinator collected all the information needed for the new pour and got him on the calendar. Sean, the Field Supervisor, was out to make the delivery. Before Sean left the concrete plant, he prepped his truck and made sure that everything was set for the delivery. On his way there, Sean contacted the contractor to provide him with an estimated time of arrival. Once at the property, Sean parked right in front of the framed out sidewalk. He extended the concrete chute out and placed it right above the formed area. Fresh concrete was mixed right there and then and poured directly into the sidewalk section. As the concrete was being poured, the crew at the property floated, edged, and finished the concrete. At the end of the delivery the contractor was able to remit payment directly to the driver using his credit card. The job was successfully completed, and the contractor was extremely satisfied with the service provided by Quality 1st Concrete. A contractor in Monmouth County was working at a site in Ocean Port, NJ and needed concrete to be delivered. He only needed about a yard of concrete to fill sonotubes, so he called a few places to get quotes. A lot of the companies he contacted would not deliver a small amount. Once of his colleges had used Quality 1st Concrete before for a small delivery, was pleased with the service, and provided the contractor with their office number. When the contractor called, the Concrete Coordinator informed him that delivering one yard would not be a problem and got him on the calendar. Jay, Senior Concrete Specialist, was in charge of making the delivery. Jay had enough material to go from his previous pour over to ocean Port, NJ so he made his way over to the job site. When he was on his way, Jay contacted the contractor to provide him with an estimated time of arrival. When he arrived, he was able to back up to the sonotubes. Jay got out of the truck and began to mix fresh concrete right at the job site. The levers on the truck were used to move the chute and pour the concrete straight into the sonotubes. The truck was moved to reach over the other sonotubes, and one yard of 3000 PSI was delivered. When all the concrete was taken out of the truck, the chute was rinsed out to ensure quality at the next job. At the end of the delivery, the contractor was able to remit payment directly to the driver using a check. The job was completed in a timely manner and the contractor was very pleased with the service provided by Quality 1st Concrete. A contractor in Monmouth County was pouring a few footings and needed concrete to be delivered. He went online looking for a local concrete supplier and came across the Quality 1st Concrete website. He saw that they were located right in Monmouth County and decided to give them a call. When he contacted their office, the Concrete Coordinator provided him with a price over the phone, and collected all the information needed for the delivery. Sean, the Field Supervisor, was out to make the delivery. When Sean was on his way to the site, he contacted the contractor to provide him with an estimated time of arrival. When Sean arrived, he was able to back up to the footings to start the pour. He began to mix fresh concrete and poured it directly into the footings. He used the levers on the concrete truck to move the chute from one footing to the other until all of them were poured. At the end of the delivery, the concrete chute was washed out to ensure quality at the next job site. The contractor was able to remit payment directly to the driver and got a receipt for his purchase. The job was successfully completed, and the contractor was very pleased with the service provided by the staff at Quality 1st Concrete. A Contractor in Fair Haven, NJ was pouring a few footings and needed concrete to be delivered. The contractor had used Quality 1st Concrete before so he contacted them to schedule the pour. When he called the office, the concrete Coordinator collected the new address for the pour and got him on the calendar. Carlos, Senior Concrete Specialist was out to make the delivery. Carlos made sure to load up his truck and made his way over to the job site. When he arrived, he parked his truck and got out to start the pour. The contractor directed him to the footings, and Carlos was able to back up to them. Fresh concrete was made right there and then. The concrete was poured directly into the footings avoiding the use of wheelbarrows, and making the delivery more efficient. At the end of the pour, the contractor was able to pay the driver directly using his credit card. The pour was completed in a timely manner, and the contractor was very pleased with the service provided by Quality 1st Concrete. A contractor based out of Mounmouth County needed a small concrete delivery to pour a section of a driveway. He was having a little trouble finding a company that would deliver one yard of concrete, so he went on a search looking for a vendor who would provide this amount. He came across the Quality 1st Concrete website and decided to call them. When he called their office, the Concrete Coordinator informed him that making the delivery would not be a problem. Sean, the Field Supervisor, was assigned to make the delivery. Before Sean left the concrete plant, he made sure to contact the contractor to inform him that he was on his way to the job site. Once at the property, the truck was parked at the front. Sean proceeded to get out of the truck and introduced himself. The area that was being poured was already framed and formed out, so fresh concrete was mixed right there and then. The truck was able to back up to the section of the driveway and the concrete was poured directly into it. As the concrete was being poured, the crew at the site floated and finished the concrete. At the end of the delivery, the chute was rinsed out to ensure quality. The job was successfully completed, and the contractor was very pleased with the service provided by Quality 1st concrete. Need price for concrete. 20'x24'x4"